Bring the outdoors in for fun in the grass with the KittyRageous Turfscratcher Cat Toy with Feather Ball! 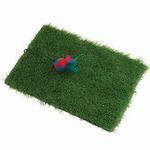 This fun mat has a catnip filled plush ball that stimulates play while the kitty turf encourages natural scratching instincts. Rolls up easy for storage and travel. I love BaxterBoo and all the options they have to choose from. Not only do I love this website and all the products I have bought, but more importantly my babies love what they get. Great website, great options, with great prices.